The spy coat is a very relaxed comfortable winter coat, made of a very soft cashmere/wool blend fabric . The coat has a relaxed fit, shawl collar and front slit pockets and closes with press studs. Sits on or over the knee, relaxed fit. The spy coat is a very relaxed comfortable in between coat, made of a check wool/viscose blend fabric. 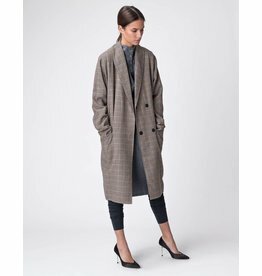 The coat has a relaxed fit, shawl collar and front slit pockets and closes with press studs. Sits on or over the knee, relaxed fit.